We are glad to announce the new update of IBProvider — v3.50. Main feature of this release — elimination of very old restrictions of our OLE DB provider. Now when connected to FB2.5+, IBProvider can correctly process linked server query «INSERT INTO … DEFAULT VALUES». In the previous releases, DEFAULT values were always processed as NULL values. Please note, that in the case of InterBase everything remained unchanged. In the new release, we added data rereading support for new and modified rows immediately after passing changes to the database. In other words, now the provider can generate queries «INSERT INTO … RETURNING» and «UPDATE … RETURNING» for updatable sets. This allows you to receive DEFAULT values and trigger-generated values. Data rereading is disabled by default. To set the required level of support, use new initialization property «server_data_back_read» or row set property «Server Data on Insert». 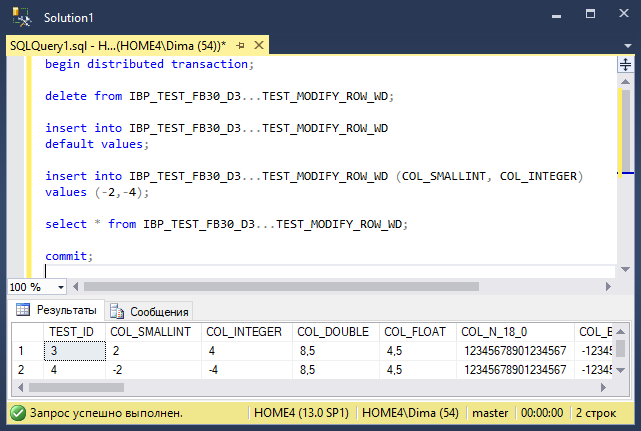 You can yourself define queries in the row set properties «insert_sql» and «update_sql». In addition to expressions INSERT and UPDATE, these queries can also contain ODBC/ADO calls of stored procedures with OUT parameters. If too many errors and warnings generated, the alert is being added «Limit of error count was reached. The part of messages will be ignored.». The provider no longer loses descriptions of errors/warnings in case of critical problems. The default value of the property «auto_insert_field_rule» has changed and now depends on the type and version of the database server. When rereading (REFRESH operation) columns with types TIME and TIMESTAMP, fractional portions of a second could be lost. We added the support of new ODS (12.2) from FB3.0.4. Publish date: 2018-05-08. Copyright: IBProvider. This material may be reproduced on other web sites, without written permission but link https://www.ibprovider.com/eng required.